The world is passing through abrupt climate changes that are a threat for biodiversity. Stryphnodendron adstringens (Mart.) Coville (Fabaceae) is a tree species endemic to the “Cerrado” biome with a high economic potential. Its exploitation is done in an extractive way, which, coupled with climate changes and other landscape changes, can contribute to its decline. Here, we use ecological niche modeling (ENM) to map its distribution and environmental suitability in the past, present and future climates. The environmental variables were derived from community climate system model, for present, past and future scenarios. The maps showed that the specie had a larger distribution area in the past, during the last glacial maximum, and it decreased mainly in the Amazon rainforest region; today, the species is found mainly in the center of “Cerrado.” For the different climatic scenarios predicted for the future and considering various levels of anthropogenic drivers for climate change, a drastic loss of climatically suitability area of S. adstringens is expected, which may compromise the viability of the species. Our ENMs can then be useful to better establish and delimit conservation actions for this important species in the “Cerrado” region. This work is supported by several Grants from CNPq, including PIBIC fellowship to ILBDB, Productivity Grant to JAFDF and LCT, and “Universal” Project (CNPq/FAPEG). HRO is supported by a CAPES Doctoral Grant. 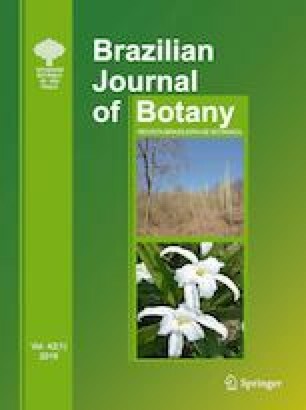 This paper was developed in the context of the Project GENPAC (Geographical Genetics and Conservation Priorities in Brazilian Cerrado), supported by CNPq and FAPEG, and is now developed in the context of the INCT in Ecology, Evolution and Biodiversity Conservation. ILBDB and HRO collected and prepared the data used in modeling, and LCT performed the computation of ENMs in software BIOENSEMBLES. ILBDB analyzed and interpreted the ENMs and drafted the manuscript. HRO, LCT and JAFD contributed to important intellectual content by critical revision of manuscript. JAFD supervised the project and gave final approval of the version to be submitted. The authors declare that there is no conflict of interest concerning the publication of this article.